Painting the dynamics of fall with regard to light and atmosphere in Downtown Holland Michigan. This special 2 day workshop will how to capture the colors of autumn while being in tune with the light and its effect on the overall atmosphere. 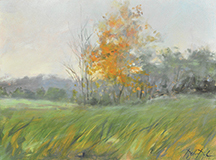 Painting out-of-doors, en plein-air will be a major focus of the study after the basics are reviewed. Discussions and lectures on basic composition, massing, building form, light and shadow, near and far, capturing and developing atmospheric distance and depending on your own style, knowing when a work is finished (learning how to not overwork your painting). Students will mix paints and learn to mix basic strings of color to help comprehend the preparation/set up to prepare to paint out-of-doors. Students will work on small canvases and the emphasis will be on capturing the time of day, atmosphere and simple elements and colors of fall along Holland’s Downtown Riverview Park. Douglas will help students pare down equipment so only the necessities are taken outside. Simple Fall landscapes will be the subject for our 2 days of painting. Demos and individual discussions/instruction will help each student to begin to reach the preliminary goals they are striving to meet. Plan to produce several studies and at least one larger paintings. Plan to bring notebook/sketchbook and enjoy some demos along with some great stories to help you remember these principles that are the foundation of Douglas’ teaching. Canvases - Quantity 2-3 5" X 7" or 6" X 8", 2-3 8" X 10"
1-2 10" X 20" or 12" X 16" or 16" X 20" or 15" X 30"
Douglas also will offer a “BASIC PAINT KIT” (while supplies last) which includes all the basic oils, brushes, palette knife, palette and canvas panels and medium for those who do not want to buy these supplies individually. You would need to bring some paper towels and rubber gloves. Douglas also will have a few French easels available while supplies last. Call the venue for pricing of this kit. The first part of the first day will be spent “in studio” at the Arts Council. We will have lecture and discussion and mix paints to prepare to go out at noon. 1st hour: Welcome/Overview of Class/Discuss principles with demos to explain ideas and concepts. Lunch: Set up at Riverside Park and brown bag lunch on site. Paint the balance of the afternoon. The second day we will meet at the Arts Council for an hour or so to review the principles from the first day, answer questions and be sure everyone is comfortable and going the right direction. We will also use this time to remix any colors and values we ran out of from the first day. 2nd hour: Paint on location at Riverside Park for balance of the day. Restrooms will be available whenever we paint outdoors within reasonable walking distance. In case of inclement weather, class and demonstrations will take place indoors at the Holland Area Arts Council. Registration specifics and Cancellation policy outlined in Holland Area Arts Council materials. Workshop limited first paid registrants. Wait list developed after capacity is reached. For more information, contact Holland Area Arts Council, 150 E. 8th Street, Holland, MI 49423, 616-396-3278 www.hollandarts.org.